Major research interests include at-risk behaviours of children and adolescents, self-regulatory intervention and prevention programs for young people, social and emotional well-being of teachers and students, self-regulation and goal setting, reputation enhancement, Attentional disorders. Professor Annemaree Carroll is Associate Dean Research in the Faculty of Humanities and Social Sciences at The University of Queensland and Professor in Educational Psychology within the School of Education. Her research activities focus on the motivational determinants underpinning children and adolescents’ educational, social and emotional outcomes and how to enhance their academic and emotional self-regulatory capacities. She is known nationally and internationally for the construction of psychometrically sound instruments for the study of self-regulatory processes and for the development of innovative and unique self-regulatory interventions for children and youth to bring about positive change in their lives. She has conceptualised and coordinated the development of the Mindfields Suite of Programs (www.mindfields.com.au), which encompass a strengths-based approach to student wellbeing that targets school-wide practices, teacher and student education and to help young people take control of their lives. She has also led a team of researchers to develop the KooLKIDS Resources (www.kool-kids.com.au), an emotion resilience program aimed to empower children to live well with themselves and others by learning social, emotional and cognitive skills that promote self-regulation and wellbeing. Professor Carroll is a Chief Investigator and Co-ordinator of Translational Outcomes within the ARC Special Research Initiative Science of Learning Research Centre at The University of Queensland where her research is particularly focussed on understanding the impact of emotions, attention, and behaviour on learning throughout child and adolescent development, and to develop and implement strategies that can be translated into educational outcomes. Dr Carroll and her research team are collecting empirical, physiological data and developing new technologies to investigate topics including: real-time emotional states of students; regulating emotions through intervention approaches; identifying neural markers of attention readiness; and teaching foundation skills of attention control in young children. In addition to better understanding the process of learning, it is hoped that these new technologies will provide translational outcomes for classroom practice and for training the next generation of teachers. Professor Carroll has had extensive experience in managing large-scale, school-based projects across classroom settings as well as clinic-based research in which she has excellent skills in test administration with children and adolescents. She has also been concerned with children with neurodevelopmental disorders (e.g., ADHD, Tourette Syndrome) to examine information processing tasks that may demand intact executive functioning and that require dual task performance and control of impulsive reactions. Professor Carroll is a registered teacher and psychologist. She has experience teaching in primary and special education in Queensland and has engaged in research and higher education teaching at The University of Queensland and The University of Western Australia where she was granted a Master of Education (1991) and PhD in Educational Psychology (1995). 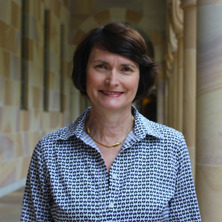 Professor Carroll's current ARC Linkage funded research (2015-2018) has continued the partnership with three Queensland State High Schools to examine how embedding social and emotional wellbeing into school-wide policies, classroom practices, and self and social strategies of students enhances learning, behavioural, and social outcomes. A new model for embedding social and emotional learning into whole of schools approaches has emanated from the project. A new social and emotional learning program for senior secondary students (Mindfields Senior High school Program) which has adopted gamification principles has been developed as part of this project.This research project has emanated from a previous three year research partnership with the same schools which focused on the implementation of a model of social connectedness to improve the social well being and the emotional self-regulatory capacities of high schools students. A new social and emotional learning program for junior secondary students (Mindfields Junior High school Program) was developed as part of this project. The recently completed ARC Discovery research (2011-2014) was concerned with the development of a new multidimensional scale (The Perth A-Loneness Scale) and the development of the KooLKIDS Whole of Class social and emotional learning program which will be implemented across primary schools in Queensland in 2015. Other Western Australian Health Promotion Foundation (Healthway) funded research (2011-2014) has concentrated on promoting positive mental health through the development of i-Connect (www.i-connect.uwa.edu.au), an interactive multimedia program for early adolescents designed to alleviate aloneness and develop self-awareness and empathy. Research within the Science of Learning Research Centre (2013-2018) has examined the nature of attention and self-regulation in the classroom and the role of feedback in the learning of children and adolescents with typical and atypical developmental trajectories. An ARC Linkage Project (2018-2020) will continue to scale up the coaching interventions for teachers to provide timely feedback to students. New technologies in the form of real time emotion apps for teachers and students have been developed to gather data on emotional states of teachers and students in classrooms. Lifespan development in an educational context: edited book. Edited by J-F., Pullen, Darren, Swabey, Karen, Carroll, Annemaree, Lombard, Samantha, Heath, Anne, Israel-Cohen, Yael, O'Grady, Patricia, Pilar Garate, Maria and Brown, Andy Sydney: Wiley-Blackwell, 2017. Adolescent wellbeing: trends, issues and prospects. Edited by J.-F., Darren Pullen and Annemaree Carroll Hobart, TAS, Australia: Australian Clearinghouse for Youth Studies, 2013. A review of the research on interventions for Attention Deficit Hyperactivity Disorder: Which treatment works best? A new approach to curbing risky trajectories of adolescent alcohol/tobacco use: A tailored brief program for parents. Impulsive action or deliberate choice: Understanding the self-regulatory processes and environmental influences of delinquent behaviour. The impact of student wellbeing, school engagement and school context characteristics on academic achievement: what are the relationships and what makes a difference over time? Education and social stratum: An analysis of the educational outliers within different social classes to understand the cause for varying educational approaches. The Development of Executive Function and Self-Regulated Learning in Adolescent Males. Developing Social and Emotional Learning Competencies in Classrooms Implementing the Schoolwide Positive Behaviour Support Program: Three Case Studies. Male ex-inmates living crime-free: A phenomenological study.